Because this is a World Cup year, I have decided to countdown to the tournament by providing a short soccer/fitness related preview of each of the 32 participating nations. In this installment, I will look at the United States, one of the strongest CONCACAF teams, that is drawn in Group G, largely considered the “group of death”. Group G includes Germany, Ghana, and Portugal. 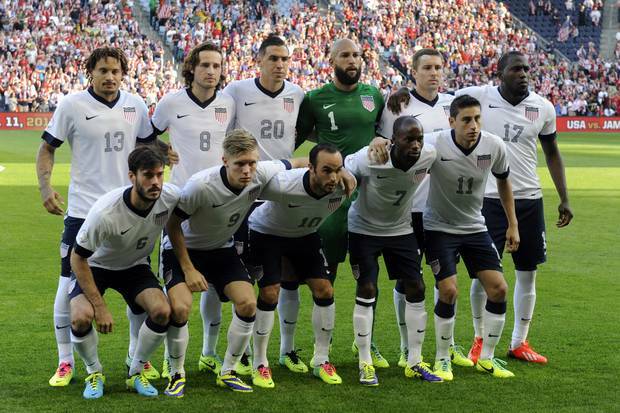 USA plays their first match against Ghana on June 16th. The United States has a very unique soccer culture and history. While the country had some early World Cup success (reaching the knockout stages of the first World Cup held in Brazil in 1950), the sport of soccer never really took hold in the States. Presently, soccer lags behind American football, baseball, basketball, hockey, and other sports such as NASCAR in terms of popularity and media coverage. That being said, in the early 1990’s soccer experienced a resurgence in the United States, firstly when the country hosted the 1994 World Cup, and secondly with the formation of Major League Soccer (MLS), which still exists today and is presently the only North American professional soccer league. The United States also poured a lot of money and resources into their national teams programs following disappointing performances at the 1994 and 1998 World Cups, and since then, they have reached a quarter-final (Korea/Japan 2002), and gotten out of the group stage at the previous 2 World Cups (Germany 2006, and South Africa 2010). In addition to these players, the USA has also developed several high level other goalkeepers who have had successful careers at home and abroad, including Kasey Keller, Nick Rimando, and Tony Meola, to name a few. At the TFC Academy (where I worked as Fitness Coach for the past 2 years), our goalkeeper coach was John Conway, another US-born goalkeeper, who played professionally in Denmark, as well as in the MLS. When we discussed this topic, he expressed his opinion that one of the reasons the United States develops so many elite goalkeepers is because young athletes in the United States are exposed to – and play a lot of – the popular sports there such as American football, baseball, and basketball, all of which require a lot of upper body strength, power, and coordination. He himself played high school football and basketball, and he credited playing those sports as having a primary role in the development of some of his goalkeeping skills, including ball catching/handling, throwing, and jumping/diving ability. Other US-born goalkeepers such as Howard and Friedel have also admitted in interviews that they believe playing “traditional” American sports as youngsters had a positive impact on their development as keepers. In the Canadian Soccer Association’s LTPD (Long-Term Player development) model, youth athletes are encouraged to participate in a wide variety of sports, and not to specialize in soccer until the 5th stage of development (“Training to Compete”) which occurs between the ages of U15 – U20. This model of “late specialization” is popular in some successful soccer countries (Germany, Denmark, Australia) but not the preferred method in others (Spain, France, Italy) who typically emphasize “early specialization” (specialized soccer training that can start as early as 8-10 years of age). In the case of the American goalkeepers, however, the number of US-born keepers playing for top clubs around the world cannot be discounted. Clearly, for the goalkeeping position, “late specialization” and participation in “traditional” American sports such as football, baseball, and basketball can have a key impact on the development of some of the athletic abilities necessary to become a top level keeper. Two of the three goalkeepers selected for the 2014 World Cup roster by US coach Jurgen Klinsmann are Premier League keepers Howard, and Guzan (the third is Rimando, who presently plays for Real Salt Lake in MLS). Of these three, Everton’s Howard is likely to be the starting keeper in Brazil. Can the effects of his “late specialization” on his overall athletic development help him enough to lift the USA out of the group of death and into the second round for the 4th straight time? We will have to wait and see what happens in 2 weeks’ time.